Description - Play inline hockey all year long with our HotShot Hockey Floor Tiles. These modular floor tiles are larger than most and have been designed to be slicker providing a smooth, seamless field of play. Easy to install and maintain, these tiles are perfect for both indoor and outdoor installations and can be used for other sports, skate rinks, and skate parks. 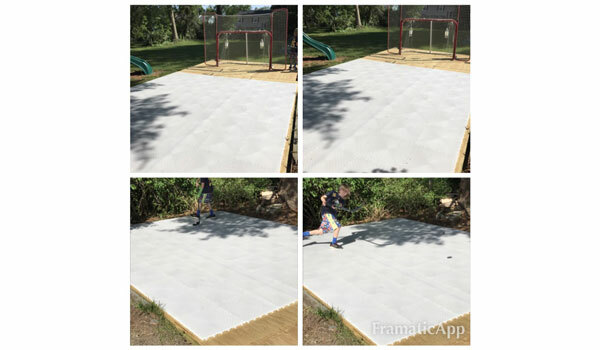 These interlocking tiles are backed by a 16 year warranty and feature a realistic faux ice color that will turn any area into the perfect hockey arena. Made in the US and built to last, HotShot Hockey Floor Tiles are the best inline hockey floor on the market today. Material - Constructed of the best high quality impact resistant polypropylene (extremely durable hard thermoplastic polymer) available. This ensures color fastness, durability, and chemical resistance in each and every tile. Recommended Uses - HotShot Hockey Floor Tiles are truly the most versatile indoor/outdoor inline hockey floor and have been used successfully as flooring for skate rinks, skate parks, inline hockey flooring, roller hockey flooring and much more. Vacuuming or sweeping any loose crumbs, dust, or debris from the court tiles when necessary. When installing the HotShot tiles, we recommend starting in one corner of the room and working your way out from there. 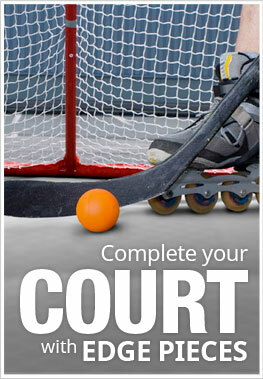 Great for indoor/outdoor inline hockey rinks, skate rinks and skate parks. Large 18"x18" tile which means less seams. I bought the hockey tiles. Do you suggest using a rubber hammer to lock the tiles together? Our HotShot Hockey Floor Tiles do not need a rubber hammer to interlock them. Just simply step on the tiles at the locking mechanism and they will lock together. You can use a rubber hammer if you like, but it is not necessary and a lot more fun to stomp on the floor. Can you drive and park on these with your vehicle? We would be putting them in the garage and we'd rather not take it apart constantly. Thanks. 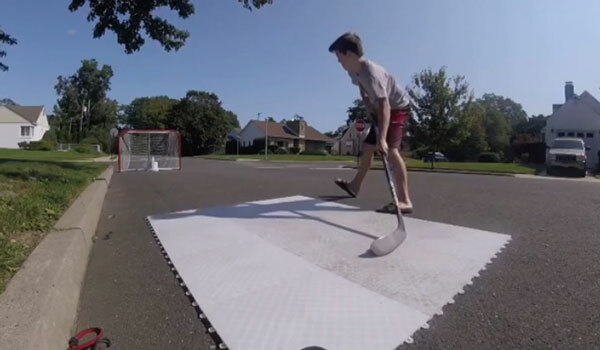 Our HotShot Hockey Floor Tiles are a hard plastic polypropylene tile able to handle the weight of a car. Can I use a regular ice hockey puck on this, would it slide well? You can use a regular ice hockey puck on our HotShot Hockey Floor Tiles. It will not slide as well as it does on ice, but it does slide very well for inline hockey play. What type of finish do these tiles have? Are they shiny or matte? Our HotShot Hockey Floor Tiles have a semi-matte finish. Can I use my regular goalie gear on these tiles? You can use your regular goalie gear on our HotShot Hockey Floor Tiles. The only thing we do not recommend are ice skates. The HotShot Hockey Floor Tiles are GREAT! The HotShot Hockey Floor Tiles are GREAT! They were easy to install and easy to clean and maintain. My boys love practicing their shots and stick handling on the tiles. I'm a hockey program director and coach with over 800 games under my belt. My 5 children play travel hockey and I play men's league when I can fit it in. I looked at several different hockey flooring tiles. These tiles were inexpensive and as good as any of the other hockey flooring tiles I used or looked at. Number Purchased - 50 Tiles. 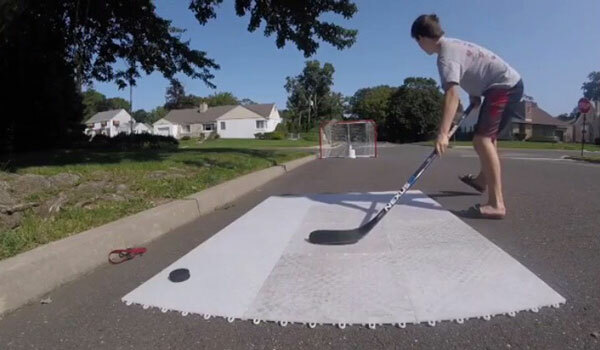 Use - Puck handling and shooting in garage with green biscuit, pucks and hockey balls. Pro - Inexpensive, durable, easy setup, tight seams, delivered quickly. Cons - Could be packaged better, I had some smashed corners in one box. I would highly recommend these hockey flooring tiles. I will likely purchase more for my garage and may build an outdoor shooting area or mini rink as my kids get older. These are some of the photos I have taken with my flooring tiles! The HotShot Hockey floor tiles purchased work great for Rollerblade use. The 18"x18" tiles are very durable and have a gripable feel when skating on. The installation of these tiles are easily done when using a rubber mallet. It took me about 6 hours to lay a 28'x15' area in the basement. Rubberflooringinc sent me a sample before my purchase and decision was made. This made my decision much more easy while deciding on thickness, durability, and installation needs. Some of my tiles were bent during shipping but was able to fix or use these as the cut side of wall. Delivery driver loaded the tiles into the garage and away from the weather. I recommend anyone to use these tiles for floor hockey or Rollerblade use, even adults.